Her job will make you want to quit yours. How often do you hear a friend say that she wants to quit her job, book a ticket, pack her bags, and then travel the world? Sounds like a dream, but for some, the idea of traveling for a living (or at least planning it for others) is in fact their version of reality. Case in point: Yessa Yu-Caparas. While Yessa's often-minimalist, man-repelling personal style is one of the things we absolutely adore about her, more so when we recently found out about her newfound career. In a lengthy Instagram post, she reveals, "As of last week, I started a new career as a travel consultant for A2A Safaris heading the Manila office and am leaving for my first major solo trip to Botswana, Zambia and South Africa in a week. If this is where taking a few chances (and a lot of wrong turns) lead, then I choose to live on the wild side (no puns intended)!" So naturally, that (plus a series of breathtaking safari photos) was enough to pique our curiosity. In an exclusive interview, Yessa talks about her love for nature, how to dress for a trip to Africa, and why being a travel consultant for a safari company merits a well-deserved #ilovemyjob hashtag on Instagram. Hi Yessa! Please tell us about what you do. "I am a travel consultant for A2A Safaris and I design itineraries for a living. As the name suggests, we specialize in luxury safaris in Africa and all our trips are tailor-made according to a client's needs and preferences." That sounds fun! How did you land the job, by the way? "It was very serendipitous. I wasn't even looking for a new job when this opportunity came my way. I was, however, at a point in my life where I wanted to take on a challenge that was outside of my comfort zone while fulfilling a personal passion. As soon as a close relative of mine who's a safari enthusiast mentioned that A2A was looking for a consultant to head the Manila office, I knew I had to give it a shot and here I am!" To be in this line of work, you must pretty much be a nature-lover yourself, we assume? "Yes. There's something about being in the midst of nature that brings about a sense of peace and contentment. For some inexplicable reason, everything makes sense when you're watching a beautiful sunset. If only for a few minutes, all is right in the world." What safari adventure would you suggest and how much would that normally cost? "At least three nights in the bush and three nights in vibrant Cape Town with a tour of the Winelands are a must. Honestly, not even a lifetime is enough to spend in the continent! The price can vary greatly because of all the choices available so it's really hard to put a tag on it." Sounds like a job for someone who knows a lot about Africa. Prior to becoming a travel consultant, did you like going on safari trips yourself? 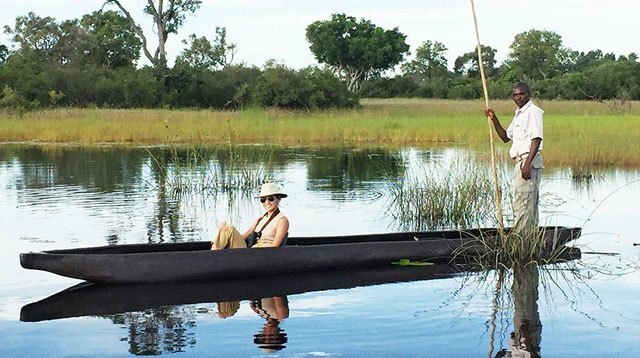 "It was my first time to explore Africa and go on a safari in my entire life and the experience was mind blowing and life-changing—it definitely won't be my last. There's much, much more to Africa to learn and see! I've only scratched the surface." Does the job require you to join your clients during their trips? Give us a fashion tip: How does one dress for safari without compromising style for comfort and vice versa? "An oversized bush jacket or a lightweight scarf worn over basic, comfortable pieces adds so much personality to a simple look… A simple tank top, comfortable pants, light jacket, and sneakers can go a long way." Oh, and you're also an indoor cycling instructor in Manila! How do you still manage to make time for other things? "I try to balance my life so that I have time to explore other interests such as trying out recipes in the kitchen and reading. When I'm not planning trips or riding a bike, you'll definitely find me indulging in these activities (almost always with a glass of red wine in hand and my dog beside me)." "Traveling and connecting with people are the best perks!"